Jhirosky, born December 2005, enjoys basketball and football. He loves to be outside and is described as caring, with a good heart. Jhirosky is described as a hard worker, he enjoys fishing, watching TV, and he loves to eat. He is a born leader and has a quiet strength. Jhirosky is very athletic, and he wants to play pro football when he grows up. Avante, born May 2008, is described as outgoing and funny once you get to know him. When he first meets others he can be quiet, but eventually warms up to be happy and talkative. 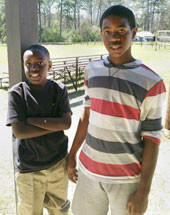 Avante likes to play both outside and inside, and he does well playing alone and with others. He enjoys playing with toy army men, drawing, arts and crafts, also with small cars, and legos. His favorite sports are football and basketball. Avante is not a picky eater and he loves to eat sweets, however his favorite food is banana pudding. Avante thinks he may want to be a wrestler when he grows up. These boys want and deserve a forever family who will love them, care for them, and help guide them to become the best young men they can be. They deserve a family who can give them a safe and secure home life, and help them navigate life through the sometimes difficult teen years, and show them what life is like when you have a forever family who loves you and is there for you no matter what!